As part of a larger comprehensive stormwater management initiative, the Chautauqua Institution is continually working to improve the water quality of Chautauqua Lake, aiming to collect and treat stormwater run-off wherever possible. This unique project transformed a former parking lot into a natural oasis by “daylighting” a buried stream and stormwater pipe outflow. Previously, stormwater run-off from uphill impervious sources traveled beneath this area in a 24” diameter drainage pipe, carrying unwanted sediments and undesirable nutrients directly into the lake below. 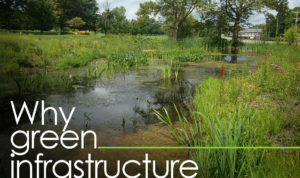 This innovative rain garden feature diverts this same stormwater run-off and filters the dirty water through an exposed bio-swale (series of natural stepped pools/rain gardens) before returning it to the outflow into the lake. This landscape feature is intended to simulate a natural creek, with indigenous boulders as weirs and native plantings throughout. The natural process assures that this “dirty” stormwater run-off is properly filtered, which helps to improve the water quality in Chautauqua Lake. Note that a more formalized garden (LeVan Endowed Garden) provides an inviting gateway into this unique natural setting, while pathways give people access throughout the space.